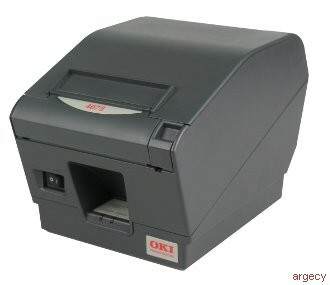 OKI Printing Solutions offers a compact, reliable single-station POS printer that combines high performance with a low cost of operation. Designed to meet the growing need for smaller, faster POS printers, the OKIPOS 407II printer has a print speed of 4.7 lines per second1- translating into 53 receipts per minute, at a crisp, clear 203 dpi resolution- for more transactions per hour in high volume environments. Engineered to keep you up and running - The OKIPOS 407II has a streamlined, wall-mounted design that can free up valuable real estate at the sales counter. The printer has a long-life printhead and cutter for maximum uptime and fewer user interventions. An optional splash cover enhances dust and splash resistance in harsh environments. Its exceptional ease of use means the OKIPOS 407II can be up and running quickly with little need for staff training. Your choice for versatility - The OKIPOS 407II prints on thermal paper and thermal labels, at widths up to 3.25" (82.5 mm) and thicknesses up to 0.15 mm. It holds a 3.9" (100 mm) roll of media. In addition to superior media handling, the printer also offers a number of useful features- such as a -double resolution- mode to assure the best print quality of logos and graphics; 2-color capability; and 2-D barcode printing (PDF417 - QR code). Serial, parallel, USB and Ethernet ports are all standard. An optional ticket alarm is available. The OKIPOS 470II: Ultra-fast and highly reliable POS print performance backed by the support you expect from OKI Printing Solutions.1 Published performance results based on laboratory testing.Individual results may vary. 3 Depending on paper thickness.